A combination of the 2 previous promos with a few seconds of new footage. Mack has been a nigh-unshakable pillar of strength (and awesomeness) (and handsomeness) since he joined the team, but we haven’t had many opportunities to explore what makes him tick. That finally changes in “Deals With Our Devils,” which challenges Mack in ways we haven’t seen before. Sometimes you have to crack the surface to see what’s inside, after all. Director Jeffrey Mace has been an enigmatic figure in Agents of S.H.I.E.L.D. season 4, and the fog only thickens in “Deals With Our Devils.” Just when you think you’ve got a handle on Mace (for better or worse,) the narrative flips once again, leaving lingering questions on that whole “team that trusts” thing. 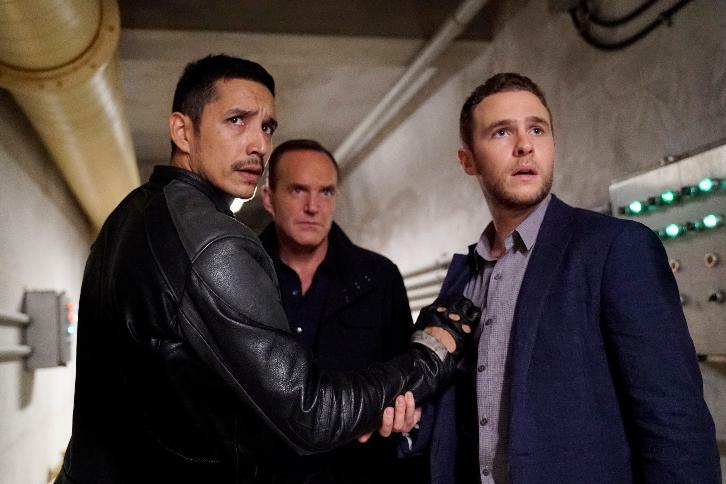 “Deals With Our Devils” – With the loss of half the team, the remaining members search for answers as the clock counts down for Ghost Rider, on “Marvel’s Agents of S.H.I.E.L.D.,” TUESDAY, NOVEMBER 29 (10:00-11:00 p.m. EST), on the ABC Television Network.